We’ve got a big lineup this year, y’all. Beginning this Saturday, we’re opening our monthly Board Meeting to the neighborhood and inviting you and your mother to join us in planning upcoming events and ideas. He’s a rundown of the events we have in mind to whet your appetite. 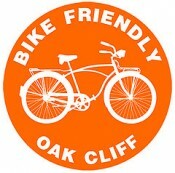 It’s going to be a good year for biking in Oak Cliff.